A new series from Panel Syndicate, and this is a ‘pilot issue’, which means that if i gets enough buys, we will see more of it! As a pilot issue, we get 50 pages for a pay-what-you-want model, and it is certainly worth your time. 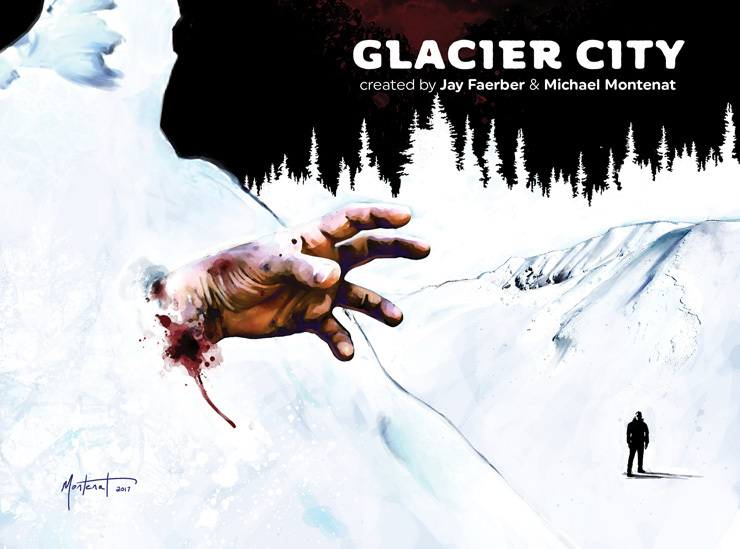 The story covers a lone policeman in ‘Glacier City’ – there is no back up here, any other police are a couple of hours away, and Wes seems to have his work cut out. Not only are there any local difficulties – these include a alcohol smuggling gang, but there is also the weather – snow and ice can cause many more problems! the build up of all the characters are well told, and each gets a good amount of time on panel to really get a feel for them all – obviously there are some secrets abound, but hopefully we will get more of that in future issues. The use of the snow and the location is well done – not only with the murder mystery, but also as a setting, with the threat of avalanches and exposure. Ah yes, the murder – you’ve got to have one of those, and the suspects are many – the witness to the previous crime, the victims, or someone else? This was a very well told story. The art and colours are really well done, with some excellent scenic shots, as well as some really well shown character moments. I recommend you get on board now, this was a really good read!